I would also pick some liberty lawn, probably the Jolie rose. So pretty! I would have some pretty Liberty cord for a Rosa dress by Tilly&Buttons. 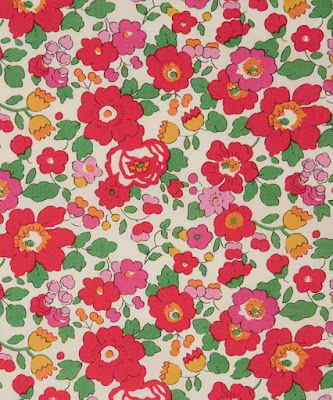 A dungaree dress is on my Autumn sewing list, so some Liberty cord in Spring Poppy would be an awesome match! spikejd[at]gmail[dot]com so hard to choose though! Definitely Liberty lawn for a dress I need to make for an upcoming wedding. I would order the Sew Over It - Vintage Shirt Dress pattern and some liberty tana lawn in the purple leila colourway to make myself a stunning dress! I would order the John Kalder May Madness fabric & some Liberty virtual light lawn, gorgeous colours. I'd have to get Liberty lawn in Betsy Anne for a beautiful button up shirt. Great giveaway and so much choice! 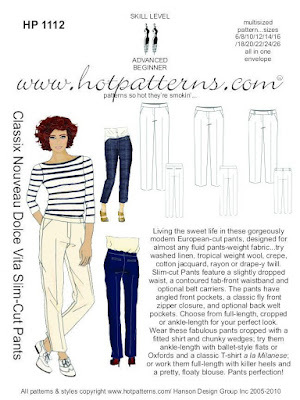 I would probably go for a trouser pattern - either the Hot Patterns 1060 Deco Vibe Cigarette pants or the Howard to do Fashion- Vanlose trousers and top. Then I would use the rest for some lovely Liberty Lawn but that choice would require even more careful consideration as there is so much to choose from. I'd love a few meters of Liberty Rossmore Cord - Wiltshire ! Probably John Kaldor black/gold batik! Some Liberty Tana Lawn - several prints. I've had that on my fabric wish list for a long time. I'd have to narrow it down, but I'm keen to try one of the Colette Patterns, especially a dress pattern. I'm thinking the wraparound one. And maybe some cool buttons, too. Great giveaway! I would love the liberty Susannah print in blue (swoon). If I won, I would use my voucher to buy the Tilly and the Buttons Fifi Pyjama pattern with some lovely Liberty Tana lawn in the Rosa print to make it with! Wow! Such a lot to choose from. I think I'd use the Liberty Rossmore cord in Jack and Charlie to make a dress or funky skirt. What a lovely shop!! I would pick some John Kaldor black/gold batik just look at how gorgeous it is!! Oh and maybe some Liberty queue for the zoo too - thats one ive had my eye on for a while!! I love liberty tana lawns so I'd probably choose one of those! I love the Maybelle blue one! I love lawn fabric, and liberty in particular, so probably that. I like the Lifestyle Bloomsbury collection, either the Virginia or Dance prints. Or the Danjo tana lawn. So many choices! I'd go for Black Wiltshire cord and make a skirt out of it. I love Tana Lawn in Capel Turquoise. Such love fabric for a summer blouse. Ooh definitely some Liberty Queue for the Zoo! Thanks for the giveaway - the Liberty fabrics are great - I've always pined for some of the Mabelle Tana Lawn and the Liberty jersey is beautiful too. I'm also a Liberty Tana Lawn, possibly in the Sweet Cherries blue colourway. Or that Liberty jersey in the pink/mauve/gold paisley that reads as burgundy. Hands down it would be some of the Queue for the Zoo Liberty Lawn. Well, I say hands down, I mean, on first view but is almost certainly end up torn between that and one of the myriad amazing fabrics they stock! I'd love some Liberty Tana Lawn in one of the Betsy prints to make blouses for my daughters. It reminds me of my Grandma's box of fabric. I've bought some gorgeous white cotton lawn for lining dresses from sew Box before, so I'd definitely get some more of that plus some fabric to make a dress for my son's school celebration day. What a fab giveaway!! I would get some Liberty Angelica Garla to make a pretty top, I really want to make myself a Liberty shirt. Oh, I think I'd go for one of the Liberty jerseys and possibly like to try one of the Cashmerette patterns like the Dartmouth or the Appleton. I think I'd pick the same fabric as you have, it's so beautiful! Thanks for organising me made May again, it's been great to see what people are making! Ooh what a generous giveaway! If I won I'd pick the liberty tana lawn in Kussman for a by hand London Anna dress, I just love the colours of it and the slightly secret pattern. I'm sure I've seen someone use it for a maxi Anna dress before and it looked stunning. I would buy a cashmerette pattern (not sure which one) and one fabric for it! Thank you for a fabulous giveaway. I'd choose some Liberty Tana lawn Small Susanna to make myself a BHL Anna dress. I like the Betsy pastel Liberty tana lawn, but there are so many pretty fabrics to choose from! I've just bought the Papercut Sway dress from Sewbox, so I'd probably choose a couple more of their patterns. The guise pants and the moana top, maybe? And I'd probably have to buy some Liberty, but it's too difficult to choose! I would have to go with some Queue for the Zoo lawn, love that print so much! So hard to choose from all the gorgeous liberty prints (they do a swimsuit fabric?!?). At the moment the Tana lawn maybelle blue is winning..